Global governance is here--but not where most people think. This book presents the far-reaching argument that not only should we have a new world order but that we already do. Anne-Marie Slaughter asks us to completely rethink how we view the political world. It's not a collection of nation states that communicate through presidents, prime ministers, foreign ministers, and the United Nations. Nor is it a clique of NGOs. It is governance through a complex global web of "government networks." Slaughter provides the most compelling and authoritative description to date of a world in which government officials--police investigators, financial regulators, even judges and legislators--exchange information and coordinate activity across national borders to tackle crime, terrorism, and the routine daily grind of international interactions. National and international judges and regulators can also work closely together to enforce international agreements more effectively than ever before. These networks, which can range from a group of constitutional judges exchanging opinions across borders to more established organizations such as the G8 or the International Association of Insurance Supervisors, make things happen--and they frequently make good things happen. But they are underappreciated and, worse, underused to address the challenges facing the world today. The modern political world, then, consists of states whose component parts are fast becoming as important as their central leadership. Slaughter not only describes these networks but also sets forth a blueprint for how they can better the world. Despite questions of democratic accountability, this new world order is not one in which some "world government" enforces global dictates. The governments we already have at home are our best hope for tackling the problems we face abroad, in a networked world order. 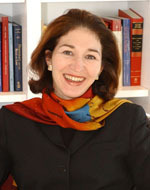 Anne-Marie Slaughter is Dean of the Woodrow Wilson School of Public and International Affairs and the Bert G. Kerstetter '66 University Professor of Politics and International Affairs at Princeton University. She is a Fellow of the American Academy of Arts and Sciences and serves on the board of the Council on Foreign Relations.